Hello, Kansas City! Summer may be coming to an end in a few weeks, but that’s still a few weeks, right?! 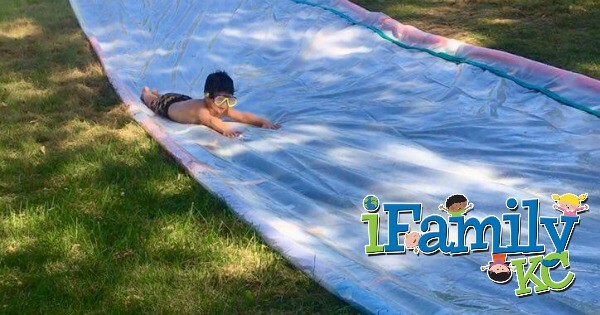 Find the ins and outs of creating your own slip and slide for ample summer, weekend fun. Summer is on its way out! Sometimes I yell that in my head in joy and sometimes in panic. It has been a blazing hot summer and I am so sick and tired of sweating two minutes after walking outside, of hearing my kids complain about getting into the car (“It’s too hot!”), and of my children being underfoot 24/7 (thank goodness we are back to school). Then I think about all the early mornings, snow, and (let’s be real) hearing my kids complain about getting into the car (“It’s too cold!”). Every year, at the end of summer, we host a backyard summer bash. It’s a huge party with all of our friends and family. We grill, drink, play yard games and swim. It’s essentially our last hurrah to get all of that summer goodness in before we’re busy with sports and school. 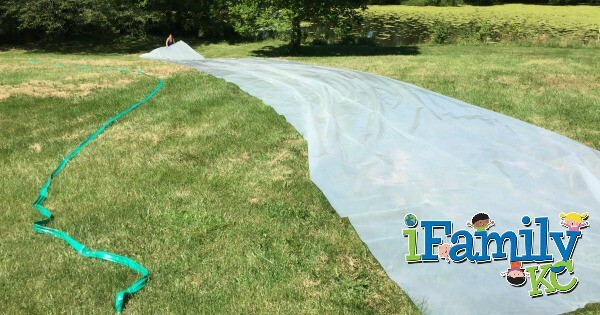 At our first party, we had an impromptu adult-sized slip and slide, and it became a must-have for our party. This year, we have a new house with plenty of room in the yard and so we went all out. 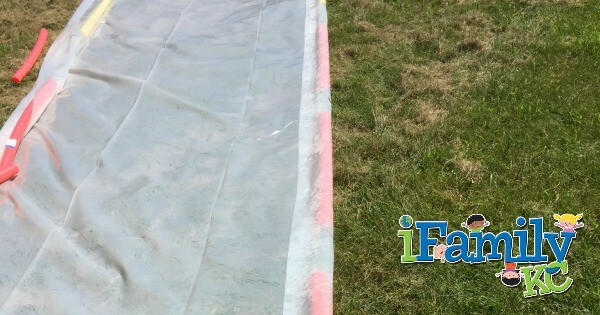 We built a massive 100ft long slip and slide and it was a total success! We always make our slides out of painter’s tarp, which we just pick up at Home Depot. We try to get 6 mil. The higher the mil number the thicker (and tougher) the plastic. This year we bought 20 x 100ft but we usually use 20 x 50ft. Our slope runs at an angle and the slide was longer than usual, so this year we decided we needed something to keep people from sliding off of the sides. Answer: pool noodles! We found a package of 35 online at walmart.com that could be delivered quickly and for free. We also stocked up on duct tape to attach the noodles. The day of the party, we spread out the tarp. Please note that the grass underneath will die and keep that in mind when you decide where to place the tarp. (That is another reason why we have the party at the end of summer.) We then laid out all the noodles along either edge of the tarp leaving enough plastic to wrap around them. 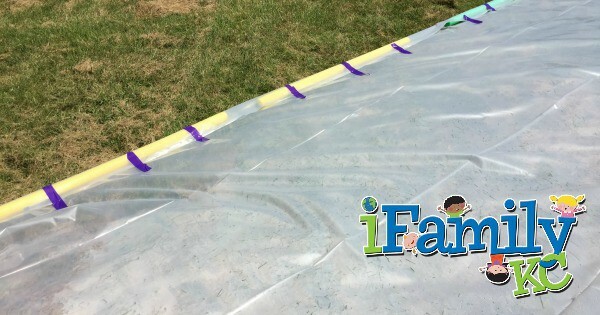 Once we had the noodles where we wanted them, we pulled the edge of the tarp over the noodle and duct taped it down. You could tape it to the noodle, but you will likely take a chunk of the foam off when you remove the tape. We wanted to be able to reuse our noodles, so we tried to not get any tape on them. Yes, the noodles did shift a bit as the day wore on, but not badly. After your noodles are all taped in, you have to flip the tarp over. I was worried we would not be able to flip it without noodles falling out or without getting it tangled somehow, but this step surprisingly went well. However, after flipping it, the breeze could get under the slide a bit, so my husband pulled some stakes out of his tent kit and secured the corners with those. He covered them up in duct tape for good measure. Finally, you are getting close to slide time! 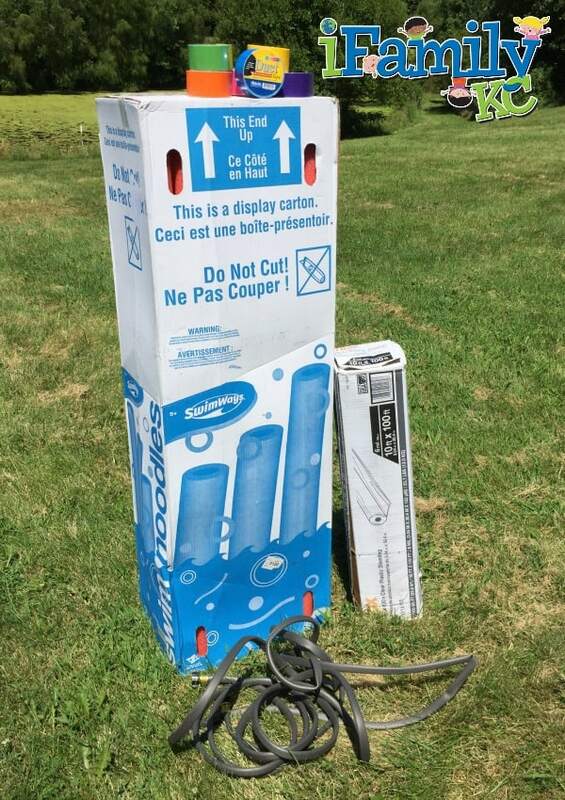 We purchased a garden soaker hose this year to use instead of a sprinkler. I think it worked much better. You have to give it about ten minutes to build up a good stream of water, but then you weren’t being hit in the face by a strong stream nor did we have any dry moments. I cannot even count how many times we all went down that slide. My backside was so sore the next day! I was feeling my age for sure, but it was totally worth it! All said and done we spent about $200 on this thing. The big expense was the tarp, but if you don’t get one that large, or if you reuse one you have at the house, it won’t be so pricey. So get out there and enjoy these final days of heat! And don’t let the kids have all the fun!